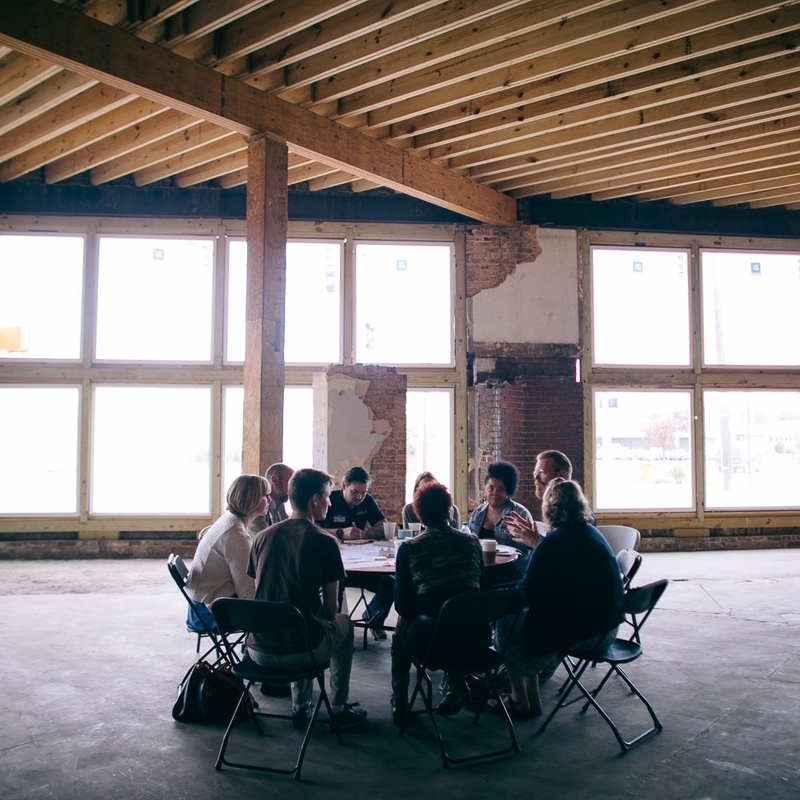 In early 2015, The Civic Hub began a partnership with Glass House Collective, a Chattanooga non-profit located on historic Glass Street. The surrounding East Chattanooga neighborhood is four miles from downtown but another world from the energy of the Riverwalk and Market Street Bridge and the Tennessee Aquarium. In the early 20th century, the two-lane commercial corridor was an anchor to the surrounding neighborhood; in the years since, the entire area has been largely neglected. Short on foot traffic and the sense of community that made the district vibrant in the past, local businesses have struggled. Many of Glass Street’s historic buildings reflect this general disinvestment, in their state of disrepair. Glass House Collective was founded to bring life back to Glass Street and Glass Street back to life. They focus their community development work on three approaches: implementing creative placemaking, getting feet on Glass Street, and developing new partnerships both for and with the community. Their goal is to leverage the power of good urbanism to create positive change in this underserved part of the city, ultimately contributing to the vibrancy of the city as a whole. Our initial charge from Glass House Collective was to coordinate an intensive urbanism workshop that would define the operational strategy for the organization over the next three years. Responding to the needs of our client and the neighborhood they call home, we crafted a smarter/quicker/cheaper design approach that brought national experts to the table, coalesced local skills and knowledge, and ensured that the plans and programs would reflect the existing assets of the neighborhood and the immediate needs of the community. As a kickoff for the workshop, we asked Mike Lydon, author of Tactical Urbanism: Short-term Action for Long-term Change, to introduce Tactical Urbanism methods and examples, giving folks a sample of proposals that might come out of the next two days of work. During the workshop, Mike served as roaming advisor to the design teams, along with Maurice Cox, Planning and Development Director for the city of Detroit, and Stroud Watson, founder of the Urban Design Studio and father of the urban revitalization of downtown Chattanooga. We structured each design team to offer a diverse set of contributions. Teams were facilitated by two leaders: one from Chattanooga, bringing insight only a local can have, and one from out of town, bringing a fresh set of eyes to the challenges at hand. Each team then included an architect, a planner, a local business owner, a local foundation representative, a public artist, a neighborhood resident, a municipal staff member, an NGO or non-profit community partner, and a graphic artist to help pull their ideas together into a compelling presentation. While the professionals brought experience to the workshop, local residents and business owners of the Glass Street neighborhood brought expertise to their teams. Whether it was knowing the informal walking paths residents take to avoid dangerous intersections, the activities neighborhood children participate in after school (and the ones they have to go elsewhere to find), or the concerns of local business owners struggling to encourage activity on Glass Street, community members were the real advocates for needed change. The need for bite-sized community transition reflects the complex challenges East Chattanooga faces, but Glass House is committed to facing those challenges hand-in-hand with the community. They know that Glass Street has indisputable assets: 1920’s architecture that can’t be replicated today, accessible suburban neighborhoods to the northeast, and 11,000 vehicles daily traveling between downtown and the recent investments from Volkswagen and Amazon on the outskirts of town. Right now, those people are simply passing Glass Street by. Developing proposals that were both inspiring but also accessible, for a small non-profit and the struggling neighborhood it supports, was the primary challenge that the design teams faced. Lighter, quicker, and cheaper solutions were the goal of the workshop, and our requirement for short implementation time frames – 1 month, 1 year, and 3 years – meant that proposals had to be realistic to the current conditions on Glass Street. Together, the variety of proposals that were generated provided a framework of possible next steps for Glass House Collective. places with people, movement with access, and investment with character. With that mission in mind, teams designed tactical ways that good urbanism can create good community on Glass Street. Urban designs in hand, and with the technical support that Glass House Collective provides, the neighborhood can work directly with local foundations, community partners, and the City of Chattanooga to be a part of the city’s success story, and that really is the next big thing for Glass Street. The Civic Hub compiled and distilled the proposals into a single set of design recommendations, organized into topics reflective of the Glass House Collective mission, in our Workshop Outcomes booklet. Our recommendations were further refined at neighborhood meetings, and partnerships have spawned to implement the community’s favorite proposals. Glass House Collective and the community will continue to adapt designs to the evolving neighborhood needs, ultimately using a bunch of little things to create the next big thing on the street. Glass House Collective was careful to explore ways to review these recommendations with everyone in the neighborhood, literally bringing the workshop to the community. After we brainstormed ways to present recommendations door-to-door, artist-in-residence Rondell Crier built this bicycle cart at his Studio Everything space on Glass Street. It is designed to be able to carry maps and drawings, a cooler, chairs, and surveys to residents, so they can help prioritize and refine the ideas in person with Glass House Collective staff and volunteers. Thanks to a local team member and his team's proposals, Glass House Collective fostered a relationship with the local Habitat for Humanity chapter and formalized a partnership with Habitat's Neighborhood Revitalization Program, connecting Glass Street neighborhood residents with the residential improvements project. The partnership connects the needs of the neighborhood with the program's intent to "enhance the quality of life in targeted neighborhoods through partnering with residents, nonprofits, funders, and volunteers." Based on one of the workshop proposals, Glass House Collective has worked with the Trust for Public Land, the Tennessee Valley Railroad Museum, and the Southeast Conservation Corps to secure a $50,000 grant for a trail connecting Glass Street to nearby Sherman Reservation National Park, opening up a major asset for the community. Can A Block Party Build A Sense of Place? A common workshop proposal was to revive the successful Glass Street Live street festival of food, music, pop-up art galleries, and place-based community-building. As part of this year's festivities, a nearby Hixson native, artist Wayne White will kick off his yearlong Chattanooga residency "Wayne-O-Rama" with a parade of two of his massive signature puppets, one of General Sherman and one of General Bragg, commemorating the Civil War Battle of Missionary Ridge that took place at the top of where Glass Street runs today.